The ultimate in quality, features, comfort and value, introducing the xterra FS5.8e. Featuring the largest and easiest to read 7.5" bright Blue backlit LCD electronics, intuitive handlebar controls and heart rate interactivity, complete with the chest strap, this is the smartest, most effective way to exercise. 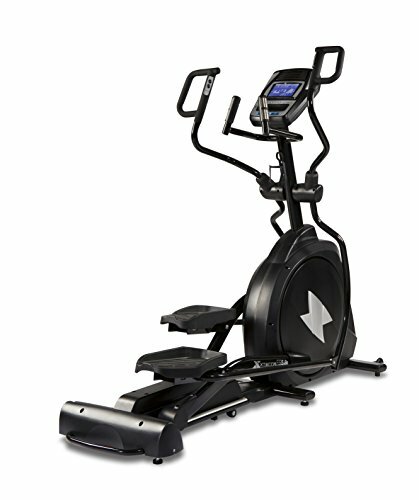 Features: ergonomic 20" stride length provides a smooth, comfortable Elliptical motion forward and reverse 2" Q factor (distance between user's feet) allowing for a better biomechanically correct stride 25 lb heavy duty steel flywheel offers premium, fluid motion Multi-Grip handlebars to maximize comfort and ergonomics 20 electronic incline levels for variety concave, high durometer wheels ride effortlessly on aluminum rails for premium motion, stability and durability extra-large 7.5" bright Blue backlit LCD electronics are large and easy to read - keep you updated on all the necessary information (time, speed, calories, program, RPM, level, distance, watts and pulse) remote resistance & incline controls on moving handlebars 7 pre-set, 2 user customized programs, 2 heart rate programs & manual program built in heart rate receiver includes heart rate chest strap audio jack and speakers for MP3 player built into the console (MP3 player not included) swivel fan to keep you cool hand grip pulse sensors (monitor your heart rate) are conveniently mounted on the handlebars to keep your workouts safe and effective 20 levels of resistance provide a variety of exercise options for all fitness levels extra-large, self-leveling, cushioned pedals integrated 2 degree inward pedal tilt for comfort front transport wheels for moving your equipment weight limit: 400 lbs warranty: lifetime frame and brake 7 years parts 1 year in-home Labor note: product ships curbside delivery and you will receive a phone call to schedule an appointment. Curbside delivery does not include inside delivery into the home or assembly.